One of the most common questions we get here at The Baby Sleep Site® is “How do I get my baby to sleep?” Especially when it comes to newborns, who seem to be experts at throwing us curve-balls, just when we think we’ve figured them out! So, today we are answering the big question for new moms – how do I get my 5, 6, or 7 week old to sleep? 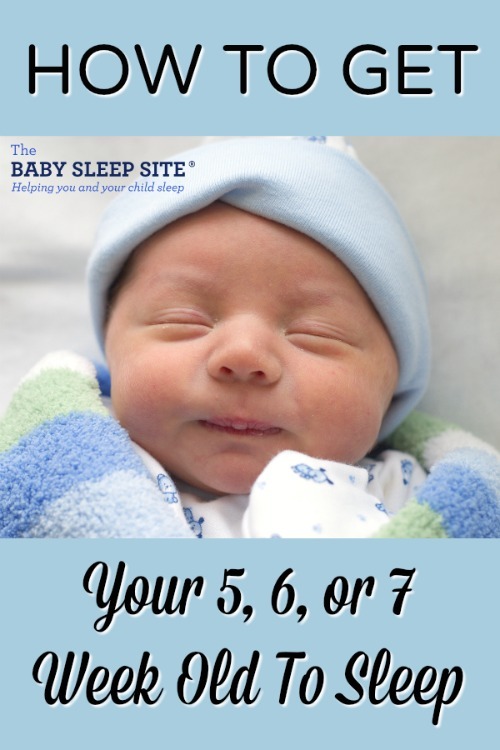 Let’s take a look at the 6 steps to help your 5, 6 or 7 week old baby sleep. Your newborn is AMAZING! There’s no denying that, and your teeny tiny baby that seemed to sleep most of the day, may begin having some longer periods of alertness, be able to grab something when you put it in their hand, start trying to bat at objects close by, and even track them better with her eyes. This is hugely exciting stuff! But this may also mean that sleep may become more bumpy and unpredictable. Who knew that your sweet and adorable little bundle of joy could also leave you so puzzled? We did! 🙂 And, we have the keys to getting your 5, 6 or 7 week old (and YOU) the best sleep possible! Setting the environment for sleep is crucial and part of cuing your baby it’s time for sleep. Although this may feel very early to you, your amazing newborn is learning every second. So, if you haven’t started yet, there’s no better time to begin practicing a consistent set of steps you do at each sleep period, at night and at nap times. It can be helpful to keep it short and sweet at this age. You might say goodnight to the house, turn down the lights, close curtains, change your baby’s diaper, sing a lullaby, nurse or offer a bottle, cuddle the baby for a few minutes while burping, and then lay your baby down for sleep while saying a key phrase (e.g. “I love you. Time for sleep. Night night.”). As your baby gets older you may want to add a story, for example, but right now it’s best to keep it brief. After all, 6 week old’s have very short awake periods and it’s important to avoid overtiredness. I know what you’re thinking… it’s impossible to have a schedule when every day is so different. And we don’t recommend having a strict schedule with your newborn, but it can be helpful to think of your day in terms of activities and start laying the foundation for more consistency down the line. Now that your baby’s hormones are beginning to normalize, and she is beginning to stay awake during the day more (as opposed to staring lovingly at you in the middle of the night! ), it will be easier to start setting a more consistent wake-up time, and first nap, for example. This can also be helpful with making things feel a bit more predictable amidst the “newborn fog” that a lot of parents can experience. What type of schedule you ask? Check out our sample schedules here or make your own custom schedule! If the previous steps haven’t significantly improved your 5, 6 or 7 week old’s sleep and you’ve downloaded our free e-Book, 15 Baby Sleep Facts New Parents Need to Know, it’s likely your baby may have some sleep associations that need to be resolved with gentle sleep coaching. Ideally, you’d get a professional assessment of your baby’s sleep challenges, but if you feel certain a dependence on parental help could be part of the issue, then you may want to consider gently sleep coaching your baby towards more independent sleep. This essentially involves helping your baby learn to fall asleep with less help from you – at this age it would be a very gradual process and with plenty of reassurance and comfort from you along the way. Not all babies may be ready for this, but many parents are surprised at how much independence their newborn can handle if given the chance. Given your baby’s age and our experience, however, we do feel strongly this should be done using a very hands-on, gentle sleep coaching method which limits crying. If gentle sleep training is something you are considering, it will be important to figure out what to do next. Some of us are planners and others do fine just jumping in. If you are not a planner, you can certainly skip this step, but if you’ve been trying to help your 5, 6 or 7 week old sleep for awhile now, you’ve developed a routine, reviewed the schedule recommendations, and plugging along without a set strategy isn’t working out so well, maybe a plan is just what you’re missing. After all, it’s hard to know how to get to where you’re going without a travel plan. Make the plan as detailed as you want it, but having a step-by-step plan helps you stay on track, committed, and consistent. Remember that things will not go quickly at this age, so it’s important to take it one step at a time, but not lose sight of your overall goals. Not sure where to begin or need help creating your baby’s sleep plan? Consider making your own sleep plan or letting us create a Personalized Sleep Plan™ for you and your baby. We hear everywhere that “it takes a village” to raise a child, but gone seem to be the days where we have a lot of help nurturing our babies. I don’t know about you, but my mom came out for only one week when my first baby was a newborn, and that was about it. My husband and I were largely on our own. No Aunts to regularly hold the baby while I took a nap or enjoyed a (hopefully hot) meal. So, getting through lack of sleep during this 5, 6 or 7 week old period can be tough without support. We sometimes have to recruit our own village. Consider hiring a sleep consultant or asking your partner, friends, or family members to help you implement your sleep plan. Having a support system in place can make all the difference in the world in reaching your sleep goals! Whether you’ve already made some progress getting your 5, 6 or 7 week old to sleep or you’re just starting on your journey to better baby sleep, it’s important to keep in mind what’s coming next. Why? Because babies are growing and changing at an incredible rate! So be prepared and make sure you plan ahead, and have a game plan in place, before the next sleep challenge emerges. Around 3 to 4 months old your baby may begin to experience their first sleep regression. What’s a “sleep regression” you ask? Now is also the time to start thinking about how you’ll help your baby through any potential setbacks (teething, travel, and illness are BIG ones!) – sometimes the key to overcoming or even avoiding setbacks is knowing when they are likely to happen, what is happening when you experience a sleep change, and having a game plan in place for how you’ll get through them! So, is your 5, 6 or 7 week old sleeping? Or, maybe it’s time to learn how to get your 8, 9, or 10 week old sleeping? My 5 week old will only stay in her bassinet for short periods of time for overnight and naps (usually just a few minutes) before crying but sleeps great when held. I know this is normal, but it means I have to sit awake with her all day and night (I’m not comfortable bed sharing). This is exhausting, and I’m afraid of falling asleep while holding her. Any tips for getting her to sleep in her bassinet rather than on a person? Thanks! Also, if you’re not swaddling, check in with your pediatrician about that – a swaddle can help many babies feel held and sleep better. I hope this helps, and good luck! The child starts to develop quickly after spending two months in the world. The parenting style also changes as the baby gets old. keep reading the article if you want to know the changes you will see in the 7 week old baby. @real Thank you for reading and for taking the time to comment! Nice article you shared. Just Awesome. I make to develop a consistent sleep routine for my Daughter. I also make sleeping schedule and I try follow that routine. I hope i will train her gentle sleep training. Already I Create a sleep plan for my family, I think if we change our daily sleep schedule, then it will be more effective for my newborn daughter. She is now napping much better. She is a happy always. Thanks again for your Article. it makes me better to change my daily schedule.